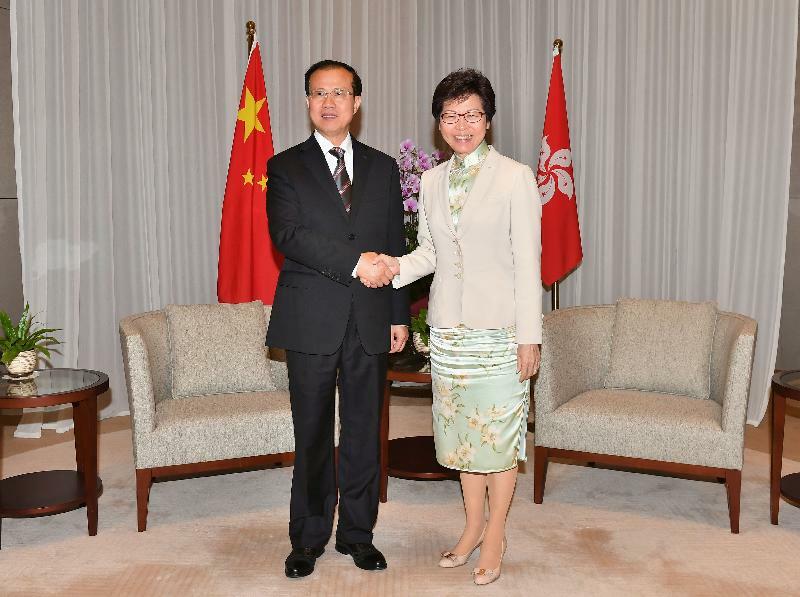 The Chief Executive, Mrs Carrie Lam, met the visiting China International Trade Representative, Mr Fu Ziying, at the Chief Executive's Office this afternoon (July 11) to exchange views on issues of mutual concern. Mrs Lam said Hong Kong and the Ministry of Commerce have established close communication and co-operation over the years. She thanked the Ministry of Commerce for its tireless efforts to gradually implement trade liberalisation and facilitation between the Mainland and Hong Kong through the Closer Economic Partnership Arrangement, creating tremendous opportunities for the Hong Kong enterprises to enter the Mainland market. She said that Hong Kong will play an active role to facilitate the implementation of the Belt and Road Initiative and the joint development of the Guangdong-Hong Kong-Macao Bay Area. With the combined advantages of "one country" and "two systems", Hong Kong serves a unique function in helping Mainland enterprises to "go global" and foreign enterprises to explore the Mainland and Asian markets.